Gilbert Jellians was baptized on 1 Oct 1624 in St Thomas Dudley, the only son of Gilbert Jellians. His father had married Alice Finch in St Thomas Dudley on 6 May 1623. The Finches were an important and well connected family in Dudley at this time and appear to have had a large nail and iron mongering business. The Jellians family throughout the seventeenth century accumulated considerable wealth and status in the town of Dudley. The Jellians name is rare and there are some contemporary uses of it in Bedfordshire and East Anglia. There may well be a connexion here as Henry Finch developed an iron mongering business, which we know supplied directly the wealthy farming districts of East Anglia with the new iron goods forged by new techniques in Dudley. It was already apparent by the seventeenth century that England’s wealth generation was shifting from the wool of East Anglia, that had driven the economy in the Middle Ages, over to places like Dudley in the West Midlands that had easily accessible resources of coal and iron. There is a baptism of a Gilbert Gellians (sic) in St Edmunds Dudley as early as 1578. This could be Gilbert Jellians (jnr) father or possibly even grandfather. The earliest of many documents held at Dudley archives that mentions Gilbert Jellians is dated 1625. This is a mortgage document for £20 between Henry Finch and Gilbert Jellians (snr) and traces the ownership of two cottages back to monastic land in 1562, that were part of the enfeoffment of Dudley Grammar School. Henry was the brother of Alice Finch and their father Jeffrey Finch was one of the original feoffees of the school. Henry Finch is described as driver or chapman, that reinforces the view that he was regularly peddling his ironwares out of the county. It could also imply that he was in some financial difficulty in deference to his newly acquired brother-in-law. Gilbert Jellians (snr) is mentioned in Elizabeth Tomlinson’s noncupative will of 1629. The nature of his service to the Sutton family is not clear but he had clearly lent them money as the request is to repay outstanding debts. It is a significant connection and stepping stone. Later, Gilbert Jellians’ (jnr) rising status is clearly demonstrated by his marriage to Elizabeth Wilmer in about 1642. Both bride and groom were under 20. She was an heiress of Thomas Wilmer of Staverton in Northants and she was directly descended from the Sutton family, the Barons Dudley, through her mother and her grandmother. 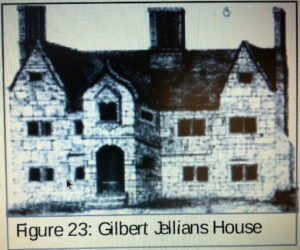 Gilbert Jellians’ merchant house, built it this time is testimony to this wealth. It survived into the 19th century and two sketches of it are still extant. A document dated 21 Apr 1657 in the Dudley archives shows Gilbert Jellians purchasing a plot of land for £24 from Thomas Payton, the younger. Situated in Hampton Lane, this date would fit with the subsequent construction of the building, some of whose stones were allegedly taken direct from the derelict priory. Gilbert Jellians had four surviving daughters, each of whom married local landed families. His eldest daughter Frances married Oliver Dixon, the eldest son of Captain Oliver Dixon and nephew of Arthur Dixon. His second daughter married Francis Corfield. His third daughter, Alice Jellians married Oliver Shaw. His youngest daughter Martha married Pynson Wilmot of Little Mitton, Worcestershire. The Dixons, Finches and the Shaws formed part of a network of families who utilized and farmed the cluster of lands originally designated to raise revenue to fund the Dudley schools, known as ‘Our Lady’s Lands’ as set out in 1562. GIlbert Jellians increasing number of land deals brought him into this circuit when the ‘enfoeffment’ was reassesed and a new deed issued in 1649. In Sep 1638, a commission had been set up by Edward Sutton, Lord Dudley to investigate the shortfall of revenue to fund the school, and in particular to investigate who had not paid rent to the mayor – both Arthur Dixon and Oliver Shaw (snr) were behind with their rent. 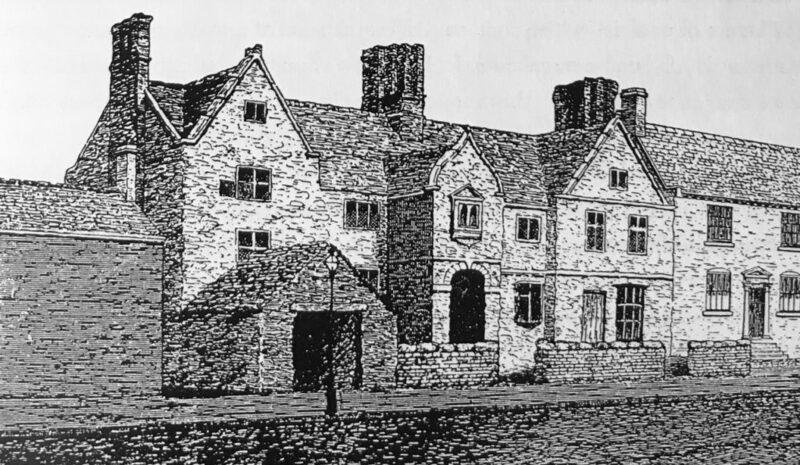 With the new order set out in the deed of 1649, Richard Foley, a leading ironmonger, led a group of new trustees that secured the future of the school. John Taylor the vicar, brother-in-law to Gilbert’s wife took a central role and (it is assumed) Gilbert Jellians then became one of the thirteen new trustees. The essence of this is only really made clear at the time of Gilbert Jellians’ death in late 1699/1700 when in his will he devolves his responsibilities to the school as a trustee to his two sons in law Oliver Dixon and Oliver Shaw. The will has a very long list of property accumulated both in Dudley and outside, with generous provision for each of his many grandchildren. Gilbert Jellians was buried on 8 Mar 1699/1700 in St Thomas Dudley. His wife Elixabeth was buried on 9 May 1709, some nine years later. Two small cottages in Dudley (abuttals including the Horsefair) and two ‘daies earthes’ in Peacocks Field, Dudley (abuttals). Mortgage for 20, Henry Finche of Dudley, driver or Chapman and Gilbert Jellians of Dudley, yeoman.Recites: 1. Grant by Letters Patent of Our Lady’s Lands to Cecily Pickerill of 25 August, 1562 2. Conveyance by C. P. to Thomas Wattwood of Stafford, clothier and Mark Bismore of London, Silkworker of 26 August 1562 3. Conveyance by T. W. and M. W. to the Feoffees of a Free School of 6 October, 1562 4. Conveyance by the Feoffees to Humphrey Jewkes of Dudley, blacksmith of the property above of 11 July, 1565 5. Property descended to Thomas Jewkes, his son who conveyed it to Finche.